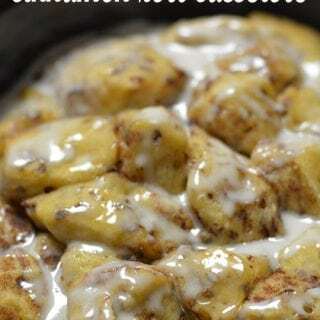 Crock Pot Cinnamon Roll Casserole - Recipes That Crock! 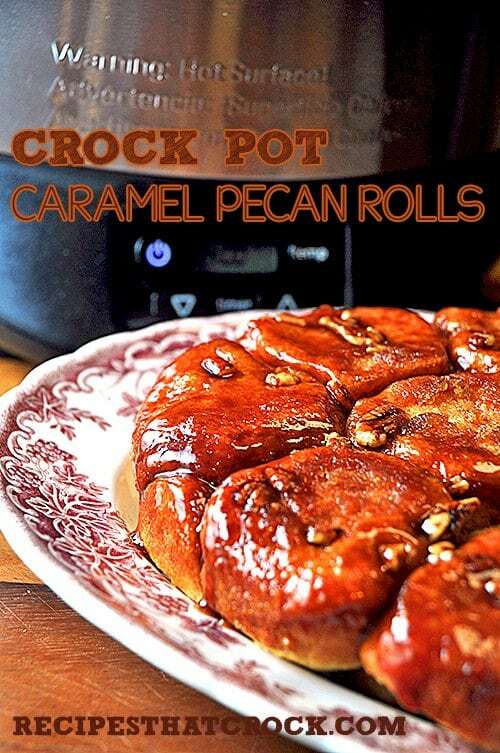 Are you looking for a crock pot recipe for the cinnamon roll lovers in your family? This Crock Pot Cinnamon Roll Casserole recipe from Gooseberry Patch’s Slow-Cooker Christmas Favorites is the perfect spin on your traditional cinnamon roll breakfast. 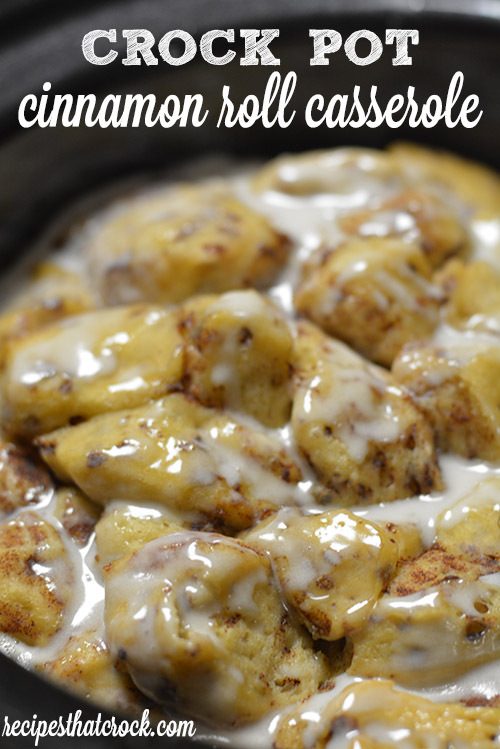 So when I saw this recipe for Crock Pot Cinnamon Roll Casserole, it brought back all kinds of memories because it too used those cinnamon rolls my mom would make each week. So I decided to give it a try when we had a lazy morning at home. When I started cRockin’ this up I realized it was submitted to Gooseberry Patch by my friend Amy over at A Latte with Ott, A. Crock pot recipe fans might be familiar with Amy’s uber-popular Slow Cooker Egg Brunch Casserole. This Cinnamon Roll Casserole definitely didn’t disappoint! The hubs and I both thought it tasted a lot like a yummy flan on the bottom with a delicious layer of cinnamon rolls on top. Definitely a keeper! 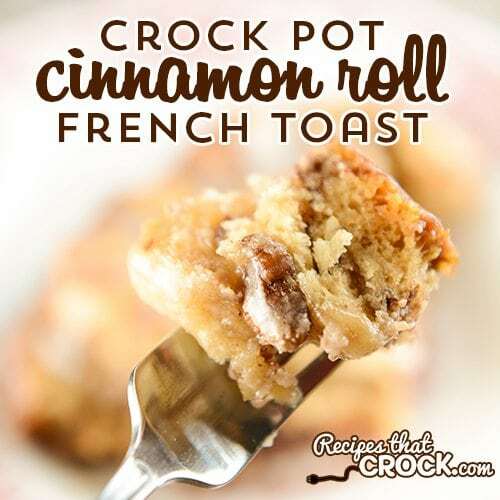 NOTE: if you are not a flan fan you HAVE to try our Crock Pot Cinnamon Roll French Toast… it is our absolute favorite way to cook up cinnamon rolls in the crock pot! 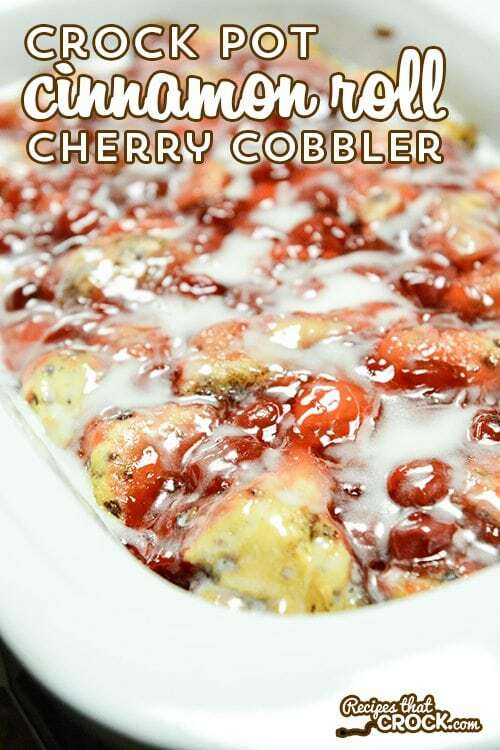 Crock Pot Cinnamon Roll Casserole from Gooseberry Patch's Slow Cooker Christmas Favorites. Cover and cook on low for 2 1/2 to 3 hours or until sides are golden and rolls are set. NOTE: It is highly recommended you first try this recipe when you are able to keep a close eye on it. Every slow cooker cooks differently, so the times listed are just a guide. Additionally, make sure that your first layer of rolls cover the entire bottom of your pan so your egg mixture can cook into the rolls, rather than below them. For more tips on making successful breakfast slow cooker recipes, please see our tip series. I love the non-stick surface of this slow cooker for recipes like this, however, any 5-6qt slow cooker will work just fine. Just make sure to cover the bottom of whatever crock pot you are using completely with the cinnamon rolls. This post was shared at The Weekend Potluck. What a great idea! Yum!! I don’t usually keep whipping cream on hand, but always have plenty of liquid Caramel-Vaniila or Creme Brûlée coffee creamer. Do you think that would be a valid substitution? Also I’m curious as to a particular crockpot size. I always use coffee creamer in things. Gives such a unique flavor! But, I’d recommend using half whipping cream, half coffee creamer. Can get a bit sweet. I’ve never tried coffee creamer so I really don’t know. We made this in a 6 qt slow cooker. Enjoy and let me know how the creamer works out ;). I wonder if these could be done in a dutch oven? I’m sure you could. I would test it out at 350 for about 30 minutes… just watching it closely until you are sure on the time. What size crock pot / slow cooker works best? We made this in our 6 qt. 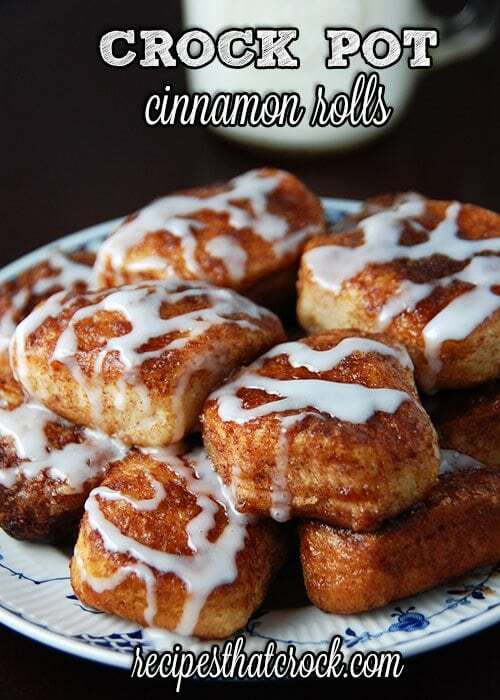 Try making a scone dough with cinnamon! Its about the same consistency! Looking forward to great, easy recipes! Thanks! Can you double the recipe and it still cook right and how much longer would I have to cook it? I have not doubled before so I don’t really know. I would just set a timer for the normal time and keep an eye on it from that point forward. Good luck! Have you done it using egg whites? Haven’t tried it… Let me know how it goes. Enjoy! Hi Jamie- When folks say “pancake syrup” it can mean products beyond just pure maple syrup (which is located in the same aisle but tastes a bit different). I used the generic brand from my walmart. It just says “Pure Maple Syrup” on it. I cannot give this recipe a high rating – as the final product was very unappealing. I replaced the tubes of cinnamon rolls with a package of Lipton Matzo Ball Soup and a can of tunafish – as that is what I had on hand. I replaced the cream and eggs with Bailey’s and some leftover Cadbury eggs from last Easter. I kept the spices the same and added some chopped pecans like an earlier poster thought about. After about 2 hours in the crock pot – the smell was overwhelming the house. I had a quick taste and set the crockpot outside. The neighborhood opossums and raccoons didn’t seem to touch it. I trust their judgement. Next time, I’ll probably try the tunafish in the packets rather than a can to see if that is any better. try leaving out the tunafish it’s a desert casserol. I think you hit the nail on the head… it is definitely the canned tuna. The packets will totally make the difference. Not sure what’s up with your wildlife though… our raccoons go nuts over the stuff. Let me know how your second batch turns out! Enjoy!